With the arrival of spring comes squirrel kittens. You may best know squirrels for their tendency to dash across the road in front of your car, but did you know that squirrels are also a major pest problem in some homes in New England? Unfortunate but true; these bushy tailed critters are actually quite troublesome which is why the New England pest control pros at Modern Pest Services want to caution homeowners about the likelihood of increased squirrel activity now that spring is just around the corner. Keep doors and windows closed unless they have screens. Do not let garage doors sit open when not in use. Replace any screens in the home that are torn or otherwise broken. Seal off cracks, holes, and any openings along the exterior of the home. Be sure to install a chimney cap. Do not store trash in close proximity to your home and only use outside garbage cans that are made of durable plastic with tight fitting lids. You may also consider a bungee cord over the cover as an added safety measure. 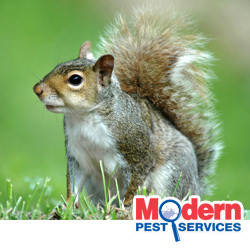 For those living in Maine, New Hampshire or Massachusetts, if you do happen to notice an increase of squirrel activity around your property, or especially if you are noticing damage to woodwork or electrical equipment, contact Modern Pest Services for effective squirrel control! Our wildlife removal team will safely get rid of squirrels infesting your home and help prevent their future return. All you have to do now is watch out for them in middle of the road!